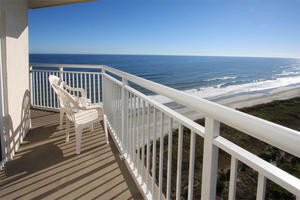 Beauty is in your own backyard when you vacation at Baywatch III 1440 in North Myrtle Beach, South Carolina. This incredible oceanfront condominium overlooks the Atlantic Ocean and has a private wrap around balcony that gives you a front row seat to the oceanfront sunrise and beachfront activity. 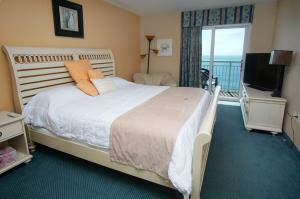 Bay Watch III 1440 is a two bedroom vacation condominium at this smoke-free resort. 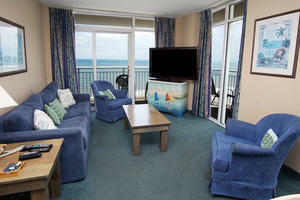 The oceanfront condominium itself is full of all the goodies you would love to have in a North Myrtle Beach vacation rental and the oceanfront balcony is icing on the cake. 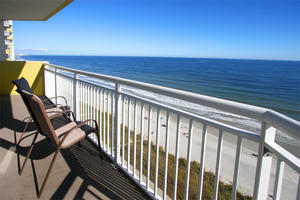 Enjoy a panoramic view from this 14th floor vantage point. An ocean breeze, warm sunshine and the occasional treat of seeing dolphins just offshore are all yours when you vacation at Bay Watch III 1440. 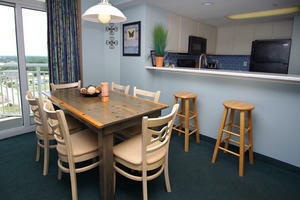 The kitchen in this oceanfront condo rental is well equipped and the living room is comfortably furnished. On the beachfront are three fabulous pool decks where lounge chairs surround hot tubs, swimming pools, lazy river and kiddie pool. 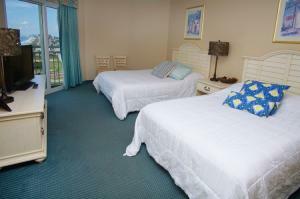 A game room and fitness center are on site at Bay Watch Resort and an indoor swimming pool is a hidden gem. There is a restaurant and sports bar at Bay Watch Resort, too. 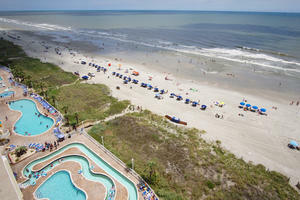 The beach is only steps away from the pool decks of this North Myrtle Beach resort and the sound of crashing waves will entice you to the edge of the water. A fishing pier in the Cherry Grove section of town offers recreation and throughout North Myrtle Beach and Myrtle Beach you will find shopping, dining and family attractions of all kinds. And do not forget about the championship golf courses. 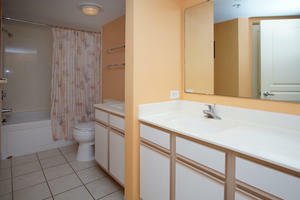 There are more than 100 in the Myrtle Beach, South Carolina area! Departure maid service is required.